So many porches sport prayer flags these days—they can’t all belong to Buddhists, can they? I think a lot of us like the way prayer flags look, and like the idea of a sending our hopes and prayers on to anyone up there who happens to be listening. It’s passive, but at the same time conscious. The wind-blown strands of flags originated in the ancient Bon Tradition, but they’ve transferred nicely into Buddhism–and across cultures. The flags themselves may be shamanistic, but the prayers we see on the modern ones are Buddhist. They bear either short or medium versions of sutras, verses giving the teachings of the Buddha, printed in lettering adopted from Sanskrit. The first Tibetan lama, Guru Rinpoche, consciously bound the old elemental spirits and made them part of the new belief system. He composed appeasing prayers and printed them on the traditional Bon flags. From that time on, it was the job of monks to copy the prayers onto cloth by hand, until woodblock printing was introduced from China in the 15th century. 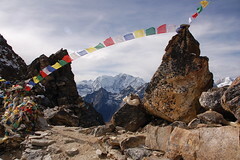 Prayer flags always appear in multiples of five, with colors in a set sequence: Blue (sky), white (air/wind/cloud), red (fire), green (water), yellow (earth). (Sometimes air and water are reversed.) Corners are guarded by the four great animals, either picture or word: Garuda (mythical bird), dragon, tiger, snow lion. The ones we usually see fly on a horizontal string, sort of like a metaphysical clothesline. This style is lung ta, meaning “prayer horse.” Some lamas say they were first used in the Bon tradition for color healing. Flag colors stay in their fixed order to ensure balance between elements in the body, which is necessary for proper health. From there, it’s a short step to imagine how prayer flags could be used to honor elemental beings, and to placate them when they became angry. Armies often carried a prayer flag pole into battle. Legend says this tradition started with the Devas, beneficent deities on their way to fight demons that plague mankind. Making prayer flags for export has become a cottage industry among Tibetan refugees in Nepal and India. The Chinese discouraged the flags at first, especially during the Cultural Revolution, but they seem to have given up on this particular battle. Traditionally, you should put up a new string of flags every year. It’s best to put them up with an attitude that they’ll benefit all beings by balancing the elemental energy in the area. Tibetans actually prefer the gauzy ones on polyester, because they’re sturdy and wind passes through them more easily. This style is actually cheaper in America, where we see most flags printed on nice cotton or polyester. When they’re worn out, it’s best to dispose of them by burning, so that the smoke can send the prayers on one more time. What if you’re not Buddhist, but want to keep some pretty flags on the porch, flapping in the wind? Inasmuch as the forces recognized by Bon shamans are still at work in our world, the flags raise the energy associated with the elements embodied in them. The traditional meaning or harmony and good-will, exemplified by Lama Rinpoche, blends with the desire many of us have to respect and learn from all the traditions of the world, not just the ones we were born with. Nice post. Thanks for a sweet read this morning.